Five DVD sessions for new believers and not-yet-believers on how to start and keep going in the Christian life. Thousands of people go on evangelistic courses each year. And then… what next? Countless Christians would love to brush up on the foundations of their faith. But… how to? Part 1:Live of internationally renowned speaker, evangelist and author Becky Manley Pippert's newest series Live Grow Know, fulfils these needs. In five interactive, informal sessions combining DVD clips, Bible study, discussion times and testimony footage, Becky explores the truth and content of the gospel, and how to begin and keep going in the Christian life. This course is perfect for new believers, not-yet-believers, and Christians who want to be refreshed in their faith. Use the DVD alongside the member's handbook and the free online leader's guide. Please note, this DVD is available in NTSC format only. 1. How Do I Know It Is Real? 2. What Is The Good News? I used this with a small group of people with very different backgrounds - ie both assured and non-assured Christians with varying levels of Biblical knowledge. A couple were used to Bible Studies which others had never attended one. The material was very easy to use and the questions ensured that we focussed on the teaching in God's Word. Group members also found the Life Stories very helpful and the Further Study section was very helpful for those wanting to know more. The whole group found it very helpful. We're using the 'live' DVD and discussion book with six women who have completed the alpha course. They are all new/ returning believers and this material has been just right for helping us to get into the bible together. really great! The professional quality of this resource is excellent and the three testimonies each week are a nice addition to the DVD material and one can pick and choose the testimonies most relevant to your own group. The teaching is good, if a little academic for some. 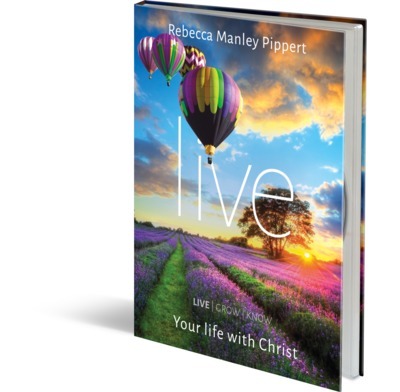 Rebecca Manley-Pippert explains many passages of scripture well in the DVD excerpts and she is easy to listen to and understand. However, for all it's positives we found we had to supplement and cut-out parts in order to tailor the studies to our group of mainly unconverted 'churched' -types. Also, although it can be run as an hour session which ours was (roughly), there was still a lot crammed into each session. Perhaps a little too much. We felt the course moves far quicker than it should to assuming by session 5 that the group will be mainly the converted by this point. While this is surely possible, it certainly hasn't happened with our group and so we are actually making up the last session ourselves with a study on Romans and other passages as we feel our group still does not understand what repentance is and therefore does not appreciate the power and need for grace. I would use this course with an understanding that you must pick and choose the parts that are most relevant to the individuals present and perhaps extend the sessions to a few more weeks to cover elements of salvation, like sin, atonement,judgement, repentance and conversion , that the sessions don't adequately cover in 5 weeks. We have learned that there are no short-cuts to thorough gospel teaching so it's a shame the course isn't more like 12 weeks long. I think it's fair to say that in 5 weeks you are really going to be only scratching at the surface of what a relationship with Christ looks like and most importantly, why we need it. Thanks for your review, Roz. Glad you found the testimonies useful. I think it's worth saying that LIVE is intended as a follow-on course for those who've already done an evangelistic course or have an understanding of the gospel message. So it's not trying to go back over the content in resources such as Christianity Explored or Uncovering the Life of Jesus. It's trying to be a follow-on, not assuming faith (or lack of it). And yes, Session Five is speaking about the Christian life, but we'd tried to couch it in terms that someone still considering the claims of the gospel could enjoy looking at it as an 'interested outsider'. I guess if the course were 12 weeks long, lots of people wouldn't run it because they'd feel it was too long!